So, who doesn’t love fries? I think pretty much everyone loves ’em. 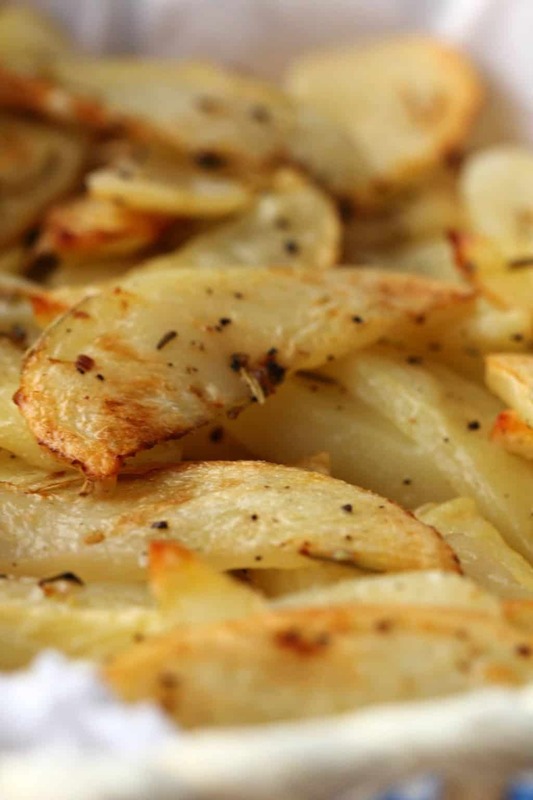 But when you make them yourself you can make some baked potato fries and this means…. you can make them with heaps less oil! 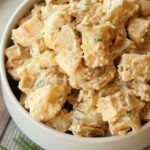 And what’s also great is you can put all sorts of delish flavorings with them like crushed garlic and rosemary and onion powder and oh my…. 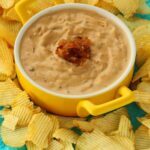 it’s so good I actually just want to make another batch right now! 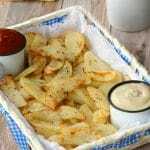 We’ve got a thing in South Africa called ‘slap chips’ it basically means soft(er) fries, so fries that are not ultra crispy. And we love those! So I’ve got a way to make these come out like that (which is how they are in these pictures) OR if you want them to be really crispy then I’ll tell you how to make them like that too. The difference really comes in with oven temperature and how long you bake them. We served these with vegan sour cream and ketchup. 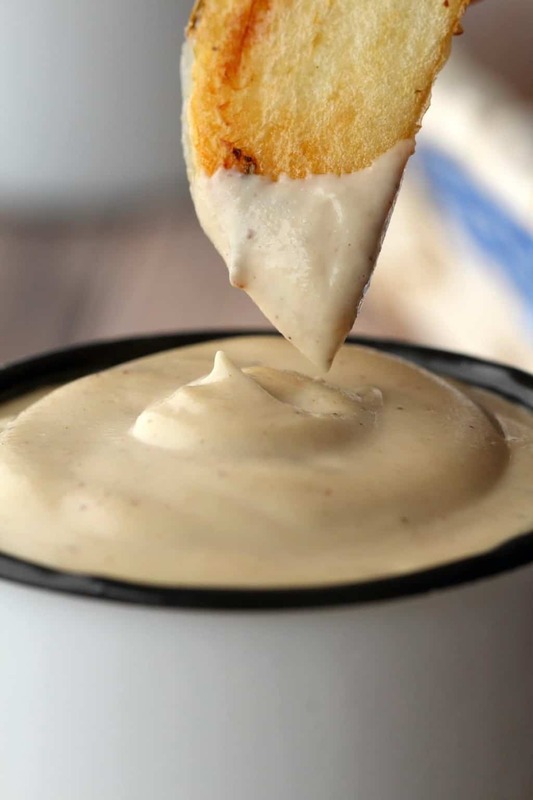 Of course some vegan mayonnaise is also good for serving, I have a recipe coming up for homemade vegan mayonnaise that just about blew my mind, I had no idea making your own vegan mayonnaise could be so easy! But let me not go off on a tangent about vegan mayonnaise now! 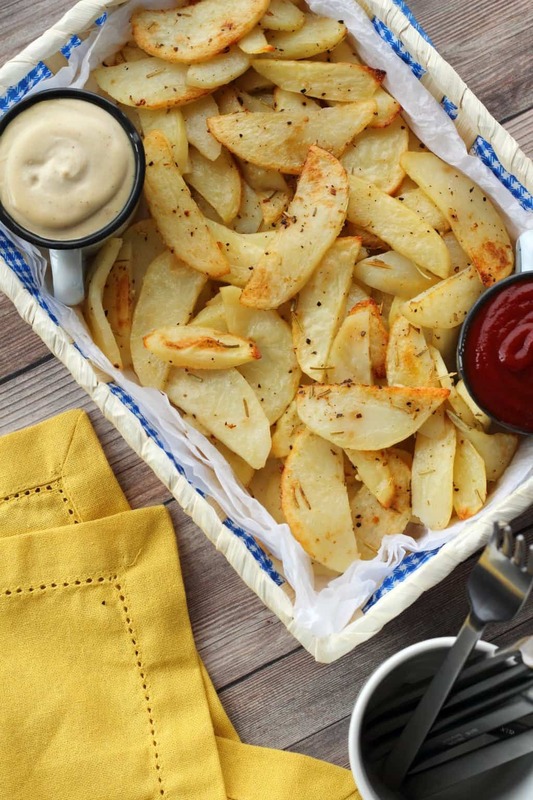 Back to the topic at hand, these baked potato fries are a perfect side, or snack or heck, just have them as a meal on their own! Making these is super easy! 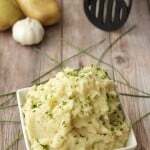 You just peel the potatoes and then slice them in half and then slice them into strips. As you can see they’re quite thinly sliced. They have a wedge shape but they’re thin as opposed to a thick wedge. 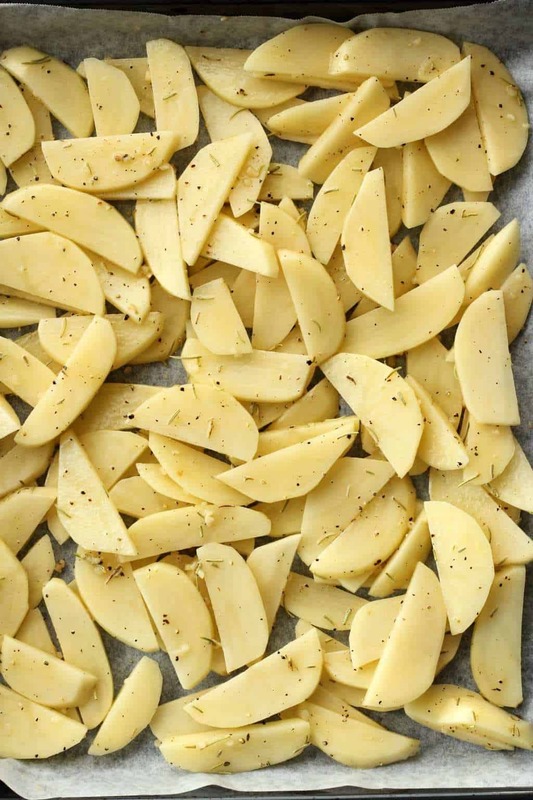 And then you just throw them into a bowl with some olive oil, dried rosemary, salt, pepper, crushed garlic and onion powder and toss together until lightly coated in the oil (only 1 Tbsp of oil for the whole batch, and it’s totally enough!). Then you just place them evenly onto a parchment lined baking tray and bake in the oven for 40 minutes and you’re done! 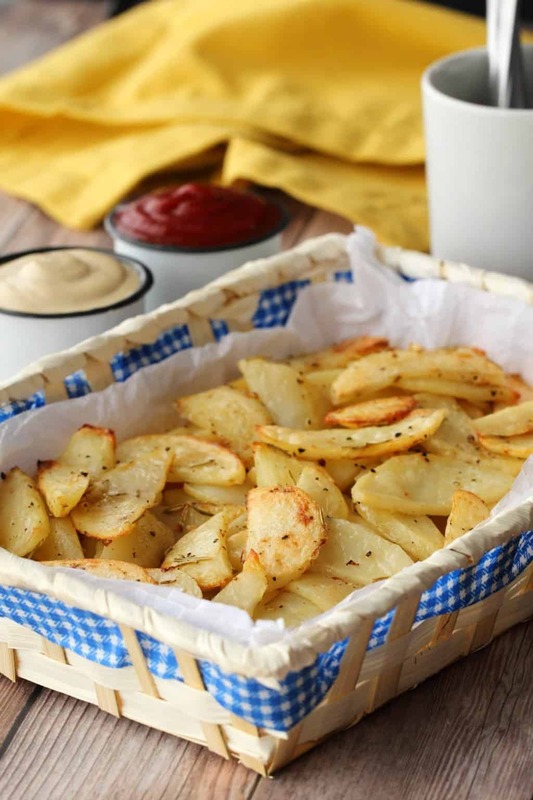 And even though the entire batch of baked potato fries uses just 1 Tbsp of olive oil you lose nothing in flavor or richness, these baked potato fries feel just as indulgent as any serving of fries at a restaurant. 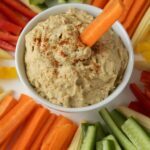 They are divine as a side served with vegan chickpea burgers or tofu burgers, or vegan falafels but also make a perfect snack or appetizer! 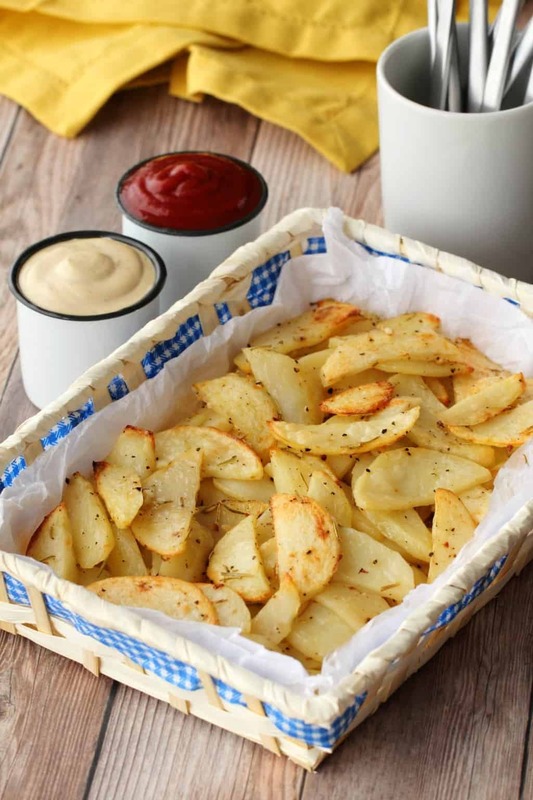 So let us know what you think of these baked potato fries in the comments and rate the recipe too! Thank you! Sign up to our email list for a fabulous (and free!) 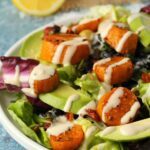 recipe ebook and to stay updated with all our latest recipes posted to the blog. 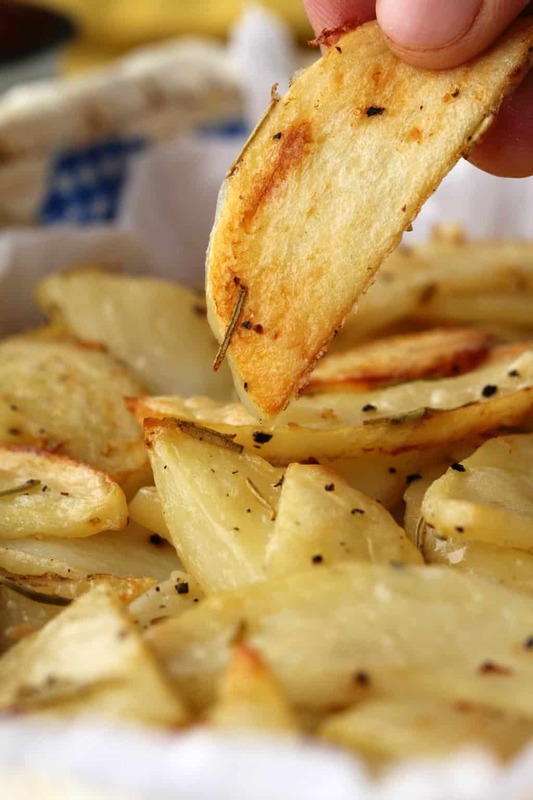 Spicy garlicky baked potato fries! 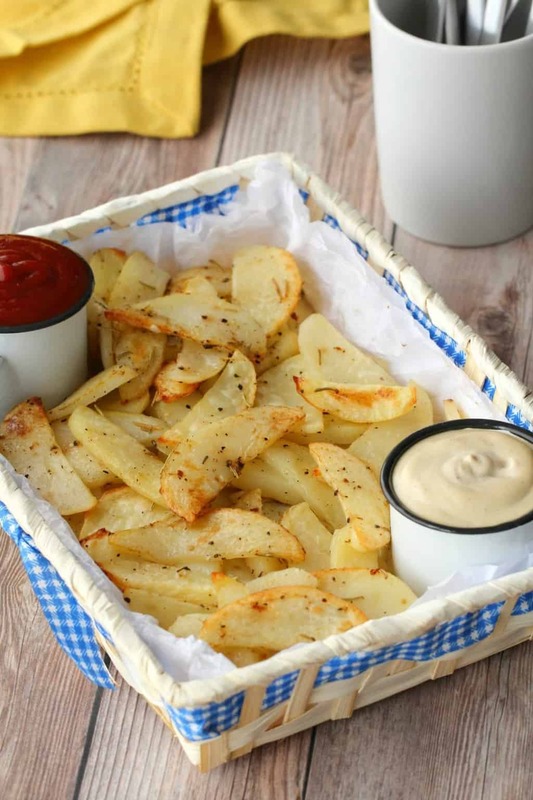 These easy and delicious fries are fabulous served with ketchup or cashew sour cream and a wonderful alternative to regular fries! 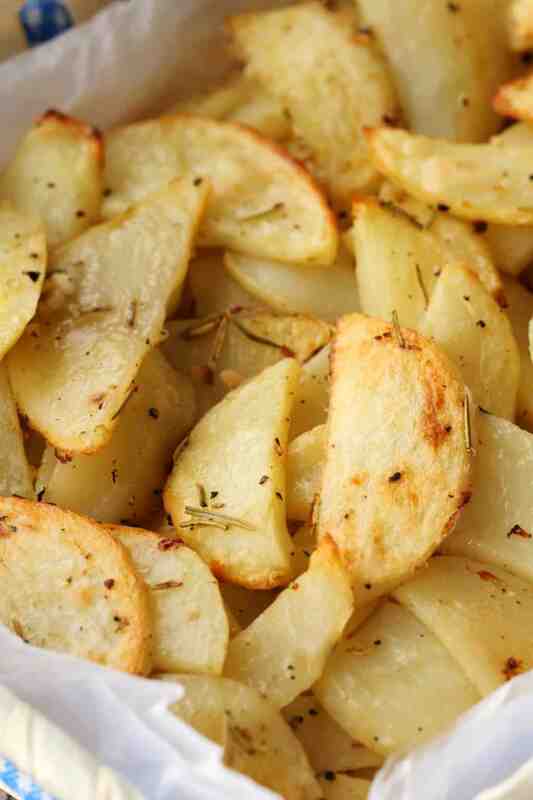 Peel potatoes and then slice in half lengthways and then cut them into slices. 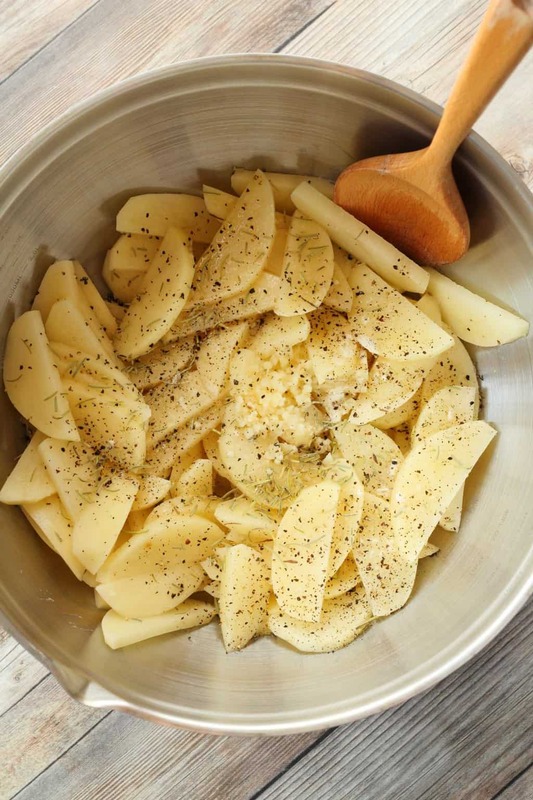 Add the sliced potatoes to a bowl and add in the olive oil, dried rosemary, salt, black pepper, garlic, and onion powder and toss together so that the potato slices are evenly coated. 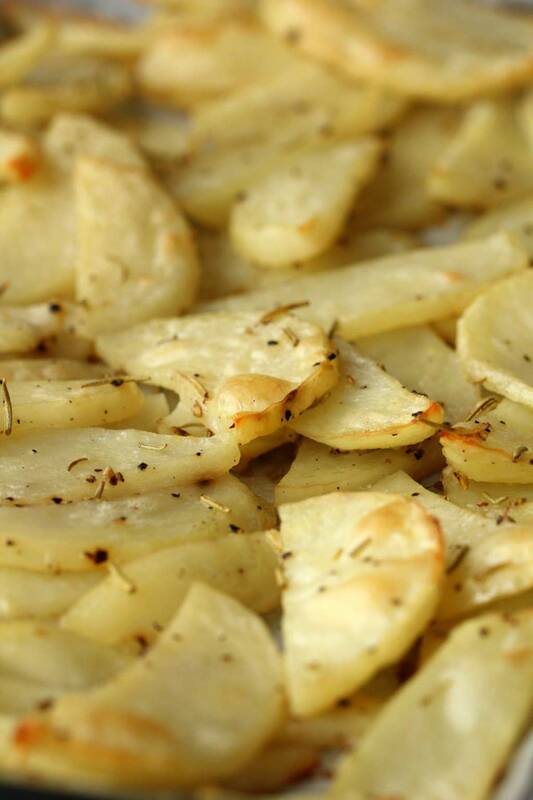 Place the potato slices evenly onto a parchment lined baking tray. 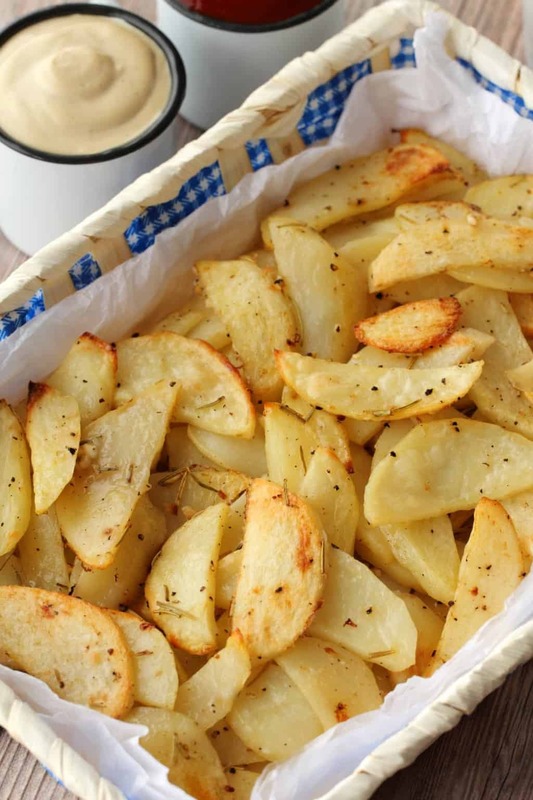 Bake the chips for 40 minutes until lightly golden on top. 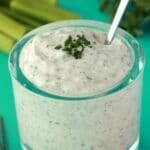 Serve with ketchup and vegan sour cream or vegan mayonnaise. 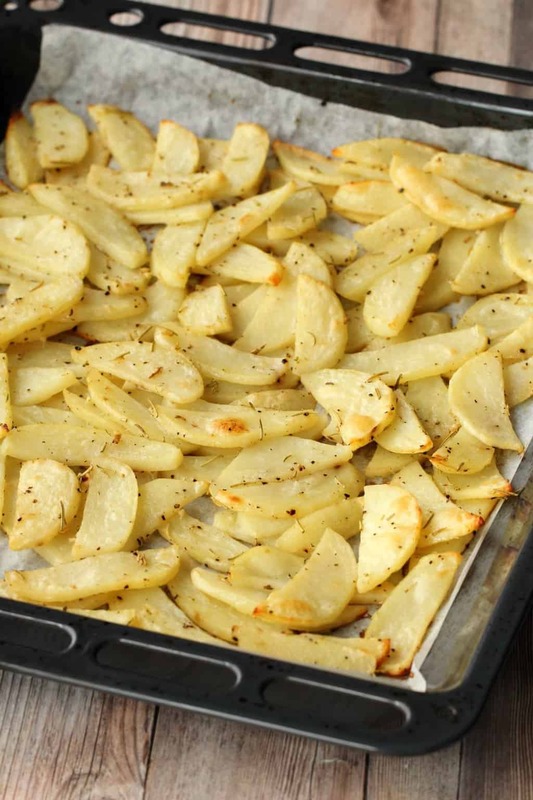 *If you want crispy fries rather than the softer version we have here, then preheat your oven to 450°F (232°F) instead. Make sure they are spread evenly across the tray and not on top of each other as the more evenly they are spread the more crispy they will be. 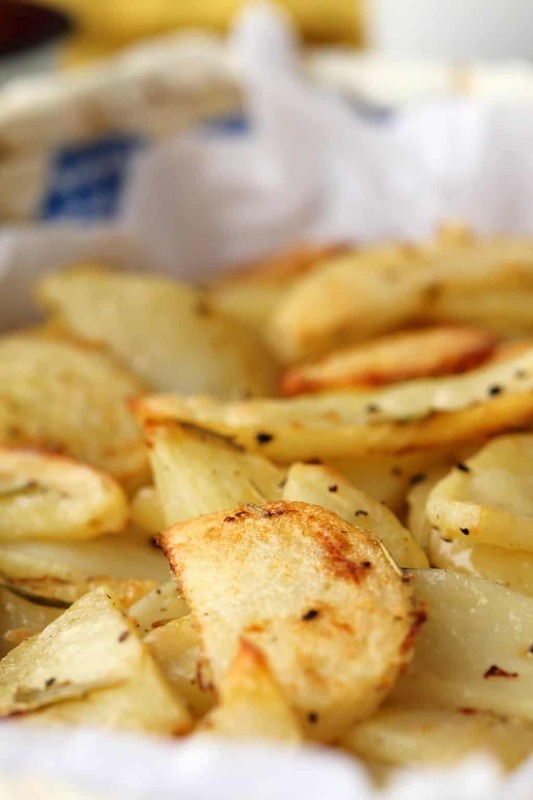 Bake them for 40-45 minutes until browned and crispy. Enjoy! 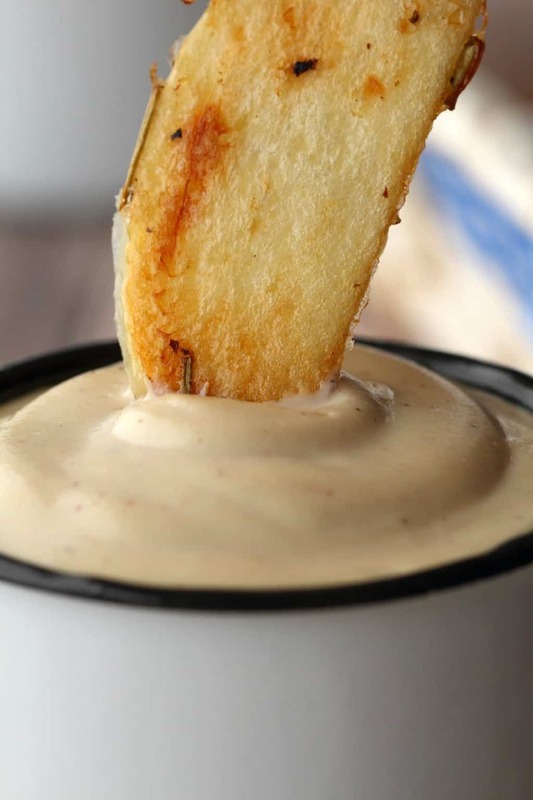 Previous Post: « How To Make Coconut Butter – 2 Easy Ingredients!